Streamlined Production Management is achieved through accurate Production Scheduling. Allocate plant resources, human resources, and materials better with data-driven decision making. Business Solution Partners helps manufacturers to optimize production and maximize profit. Realize accuracy, efficiency and speed, and get total control over the production process with scheduling solutions from BSP. 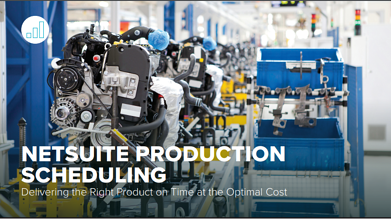 Download The NetSuite Datasheet For Production Scheduling Solutions Now! Bake your production recipes with accuracy and efficiency whether you employ forward or backward scheduling. Get real time visibility into material availability and streamline resource allocation. You can master the production cycle and make manufacturing easier. Business Solution Partners has been working with Manufacturers for over three decades, providing the right technology, guidance and training to maximize efficiency and unlock profit potential. We are Manufacturing Experts, employing technology and process solutions from raw material to finished product. We're proud to be the technology company supporting of some of the worlds largest Pharmaceutical and Medical Device Manufacturers. And we're dedicated to moving your manufacturing business forward. . . The right production scheduling system must be complex enough to handle your business requirements, yet still provide a level of usability that doesn't require a PHD to master. NetSuite's Production Scheduling Solution strikes that balance, enabling realistic scheduling with minimal effort. With Drag-and-Drop Scheduling, a Real-Time Scheduling Engine & Updates from Production, Calendar View, Batch Scheduling, and many more features, you'll find NetSuite's Production Scheduling system provides production visibility and functional optimization.